On March 8th, 2012, the official website of MBC drama series The Moon Embracing the Sun published a video clip that features the interview with actor in leading role, Kim Soo Hyun. Here’s the video clip of the interview and the English translated transcript of the interview in the video clip, which also features several behind the scene highlights and background music of Tears of the Sun. Q: When acting as Lee Hwon, which part is emphasized? Q: As the protagonist of a national drama, what’s the reaction of people around you? Q: What’s the similarities between Kim Soo Hyun and the character of Lee Hwon? Q: How’s the acting in cooperation with co-actors in the drama? 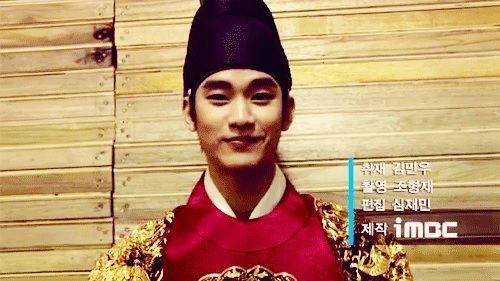 Q: The Lee Hwon played by Kim Soo Hyun is? Q: What’s the secret for the popularity of The Moon that Embraces the Sun? “Thank you very much for so loving The Moon that Embraces the Sun. Now it’s the final week, not much time left, I feel really strange. Haha. All the actors and staff crews have worked extremely hard, and because of the painstaking, we’re very close together, therefore there is very good effect. I think, it’s very honored to be able to meet so many seniors, co-actors and staff crews. For me, I think it’s hard to have such an encounter again. So at the end with the grateful heart. Really thank you.